Some of Australia’s most prominent Indigenous artists have converged on Charles Darwin University for the opening of an historic exhibition. His Hon the Administrator of the Northern Territory, Mr Tom Pauling AO QC, along with the Minister for Arts and Museums, the Hon Gerry McCarthy MLA, officially opened the CDU Art Gallery and with it the exhibition entitled Nyini parlingari purrupakuluwunyi, amintiya kiyi nyingani awarra Jilamara: Looking back, looking forward in our Art. Curator of the CDU Art Collection and Art Gallery, Anita Angel said it was a great honour for the institution and the Gallery to attract such a prominent body of work. “The Tiwi Design Collection was created to be seen,” Ms Angel said. Among many prominent artists, the exhibition attracted one of the most senior and renowned artists on the Tiwi Islands, Jean Baptiste Apuatimi and her daughter and the first Tiwi woman to hold a solo exhibition, Maria Josette Orsto. 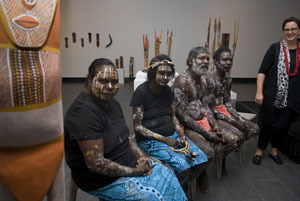 “Tiwi Design is one of the oldest and artistically diverse Aboriginal art centres in Australia,” Ms Angel said.